This entry was posted in Art, Behavior, Child Raising, Children, Children's art, Children's books, Entertainment, Holidays, Humor, fun, jokes, Kids, Parenting and tagged behavior, child raising, Children, Christmas countdown, elf on the shelf, elf on the shelf adventures, elf on the shelf book, fun, gingerbread house decorations, humor, kids, Lego Star Wars X-wing fighter, paper snowflakes, Parenting. Bookmark the permalink. I saw your postas I was writing mine, how funny! 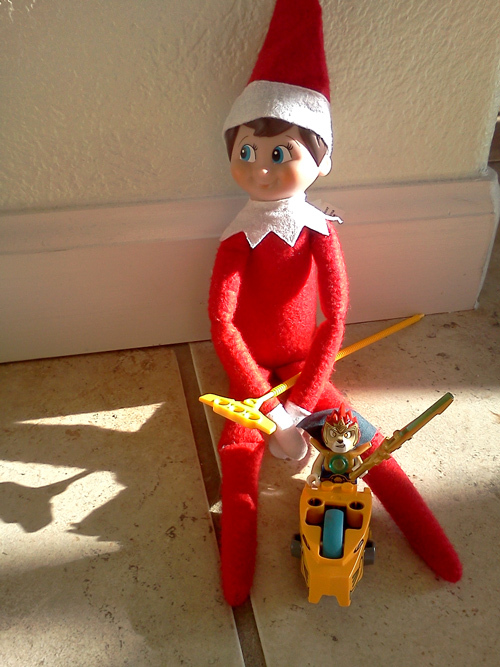 I just love my kids’ innocence that makes them believe their elf moves around because of magic. And yes, that gummy worm was funny. My son moved it as I was trying to take a picture, so I’m not responsible for that one. Oh, they have done stuff like that before, including sticking long things in between their legs. It’s amazing that male humor never graduates past that stage! I’m sure Carrie’s son’s and I had the same idea of Wink with his gummy worm, and it’s not PG! Hahahahahaaahahahahhhaa! Haha, as I just replied to her, I didn’t put the gummy worm like that originally but that made for a funny picture. 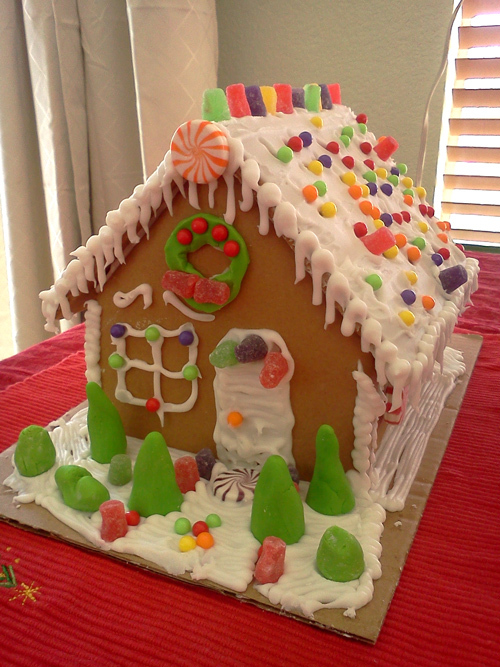 Oh, I’m looking forward to seeing your gingerbread house! I promise to post some pictures! Wow – he’s been busy for someone with no feet! I love the white board drawing he did of himself. That’s great that he’s been able to find so many fun things to do. I only hope he doesn’t run out of ideas before Christmas! He sure does! The tooth fairy is supposed to visit us tonight so I wonder if he’s going to give her a hand. BTW: These photos are ADORABLE. 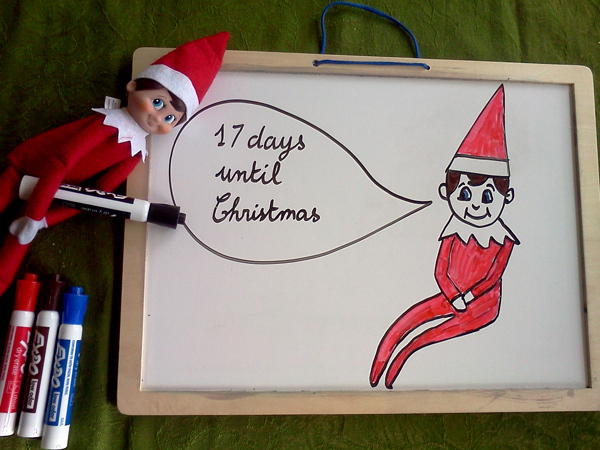 What a great collection of activities for your wee elf. Thank you! He had fun helping out the tooth fairy last night. 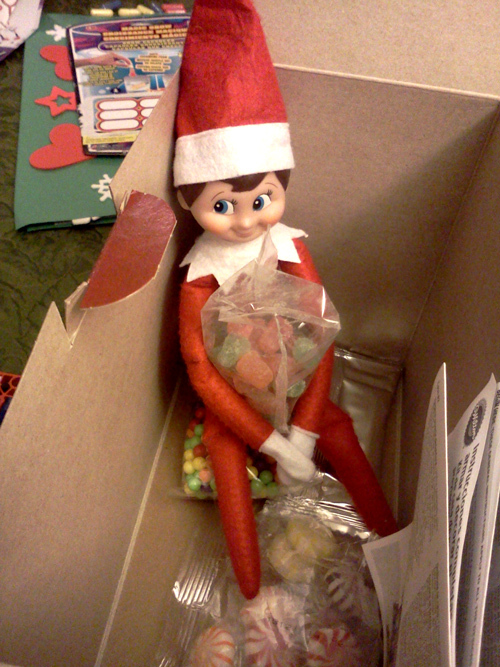 I’ve never done the Elf thing yet with my kids, but they were pretty old when I first heard about it. I think they would have loved it like your boys if I had thought of it back then. Oh well. Maybe someday I can get one for my grandkids (which should be a ways off still). It came out in 2005 so it’s been around for a while. 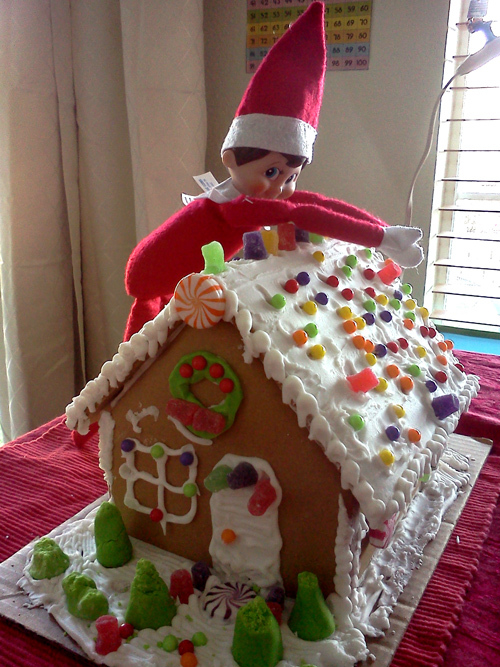 Don’t get it for your kids unless you want them to compete with Carrie Rubin’s sons’ elf scene creations! 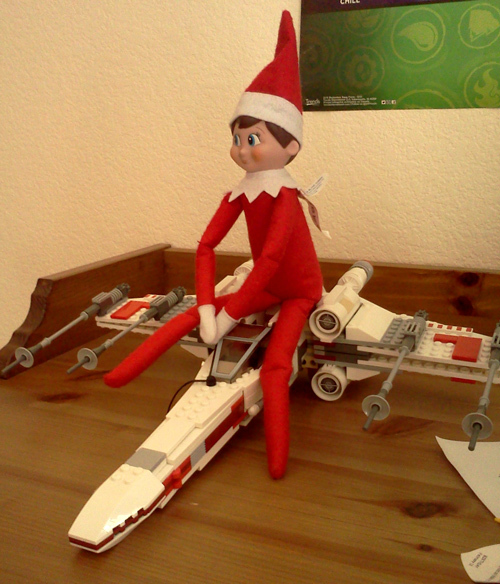 So you think using Elf on the Shelf is good parenting. The pagan cultures used Fairy Tales to teach the children about morality instead of biblical instruction. Is it Innocent or satan’s subtle attack on parenting? We are becoming more of a pagan nation and this is another example of something that seems innocent to the naked eye! 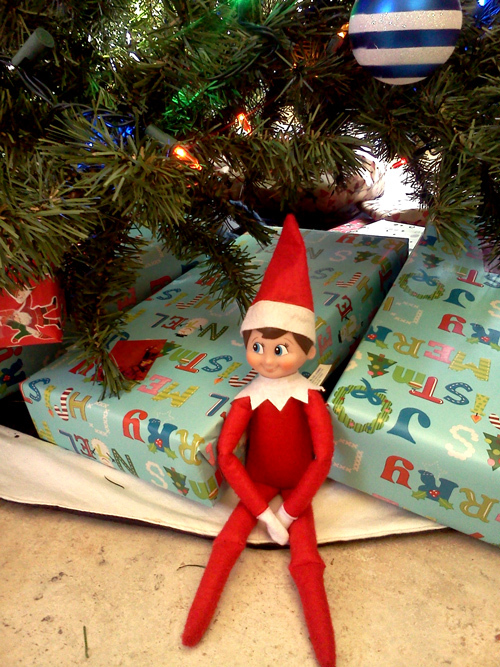 As an Atheist family, we feel our elf on the shelf is right at home and a great way to enjoy the magic of Christmas. 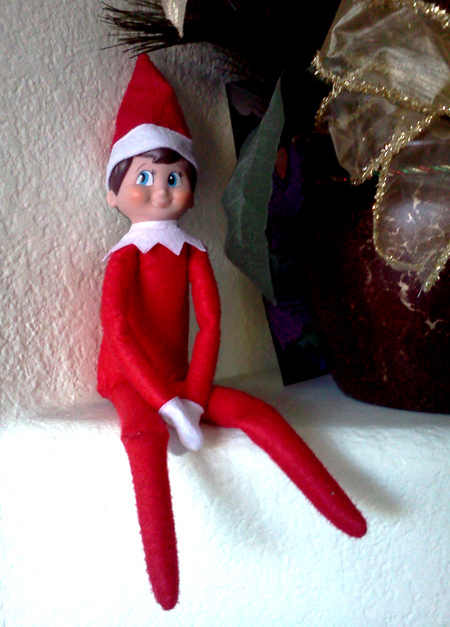 If you read The Elf on the Shelf book, you’d notice there are some religious connotations. 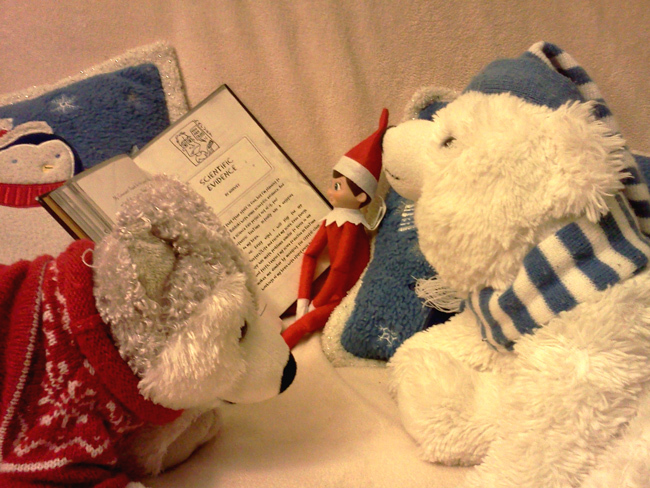 It’s lovely to get a glimpse into your special family time through Wink’s eyes! 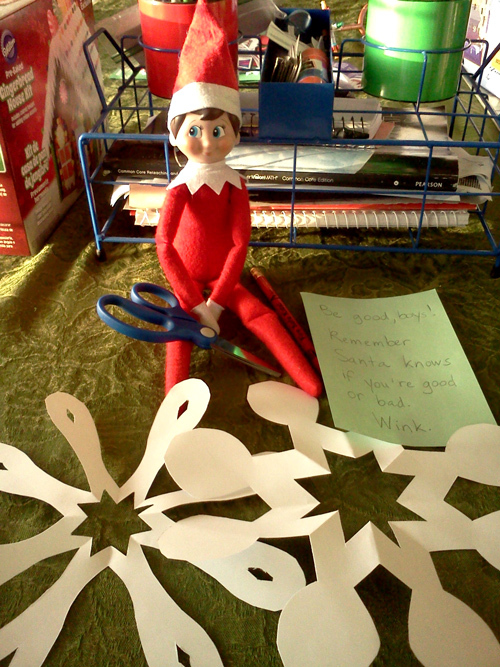 Wink had a blast! Those Legos are a lot of fun. My son is crazy about Star Wars, Ninjagos and chimas too. 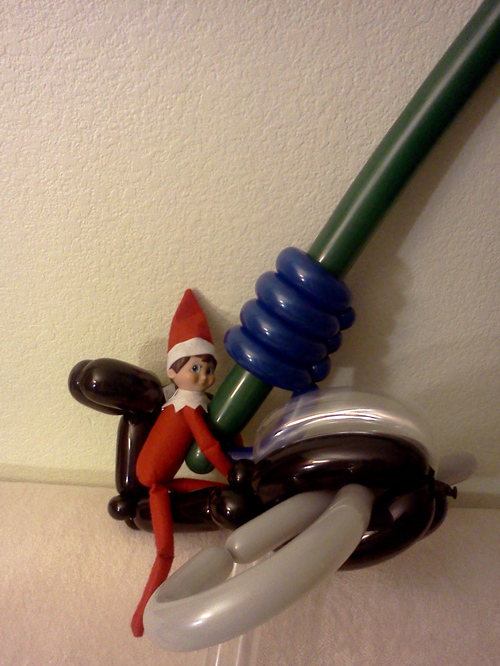 Next year, I need to add more elf on the shelf adventures. Thanks for the ideas. Merry Christmas and a great New Year to you and your family. We definitely had a Lego Chima Christmas at our house. It’s amazing how fancy they make them.